If you are heading into the city or out of it to the airport from Bolton, we’re here take you to whatever your final destination is. Over staff is available at your disposal around the clock. No matter what time of the day it is, you can call us whenever you want to avail or services and we will accommodate your needs – including on holidays. We assist you in choosing the right vehicle as per your needs, that to on an affordable price. No matter how many people are travelling, our drivers, who hold a safe driving record as well as an extensive knowledge of the area, carry out their duties punctually, ensuring that you are delivered to your destination on time. seater. These are the ideal choice for sports teams, church groups, lathe families or tourist groups travelling around the city for shopping, entertainment or getting acquainted with the rich history and culture of Bolton. Our 14 seaters have enough room to comfortably hold its passengers and their respective luggage with astonishing ease, still leaving a little space behind not to suffocate the customers. It also offers ultimate privacy to the travelers; all hail to its tinted windows. We don’t believe in robbing our customers and so offer our vehicles at a reasonable price. The rent of a 14 seater is quite fair and varies with the amount of the rental told. Higher the rental time period, higher will be the rent. A weekend rent will logically be higher than the rental that acts as a shuttle to transport customers to and from the airport. 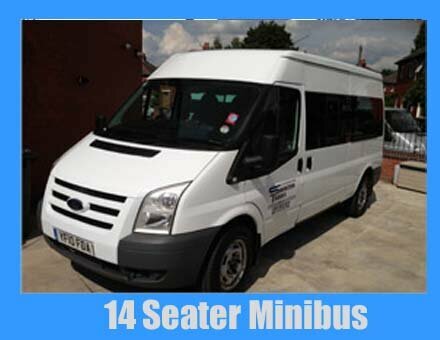 To ensure the availability of your 14 seater, make your travel arrangements before your trip. You can have an idea of the prices by filling the online quote form. Our staff is there to help you out all day and night. If you have any questions, like how to fill out the online quote form, or any other query, then our skilled staff would guide you through. You can contact us at the time which suits you the best. If you want to book our vehicle immediately then contact us right away via phone or email. We provide you with the best possible vehicles for you and your group to make sure you have an amazing trip in Bolton.